Michael Kreill drives into the paint during Butler’s win over West Carrollton on Friday. Butler’s Alex Plummer battles for a loose ball during Butler’s win over West Carrollton on Friday. 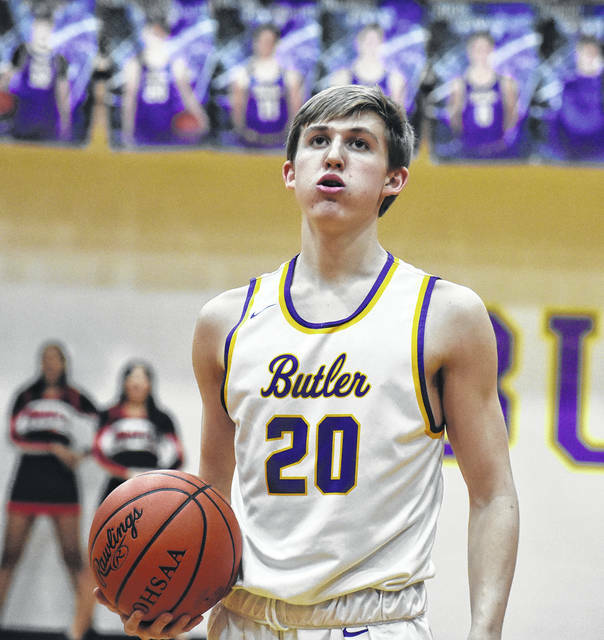 Spencer Imwalle scored a career-high 11 points during Butler’s win over West Carrollton on Friday. 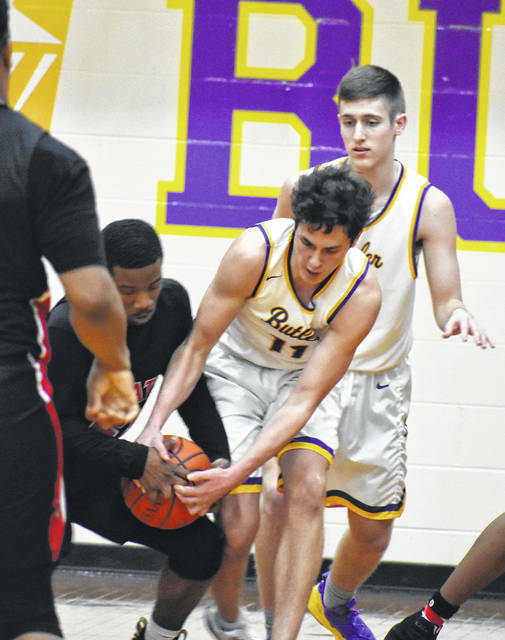 VANDALIA — The Butler Aviators have become accustomed to slow starts – but none this season has been quite as slow as the showing Friday night when the West Carrollton Pirates came calling. In a display of offensive ineptitude rarely seen on the varsity level, the two teams slogged through a first quarter that left the score at just 4-3 after the first eight minutes of play. 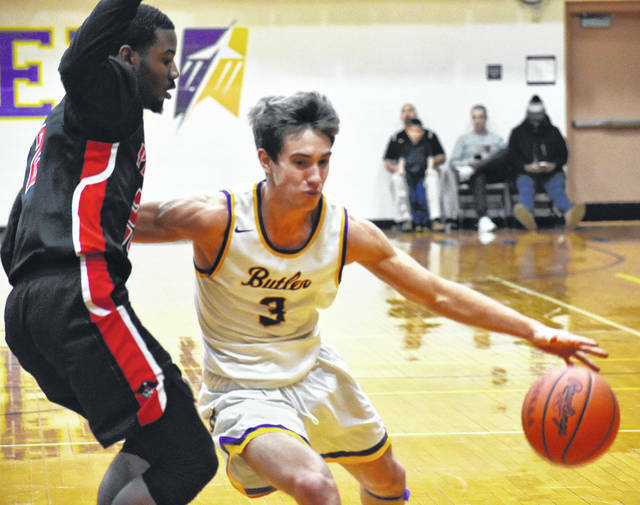 Butler’s defense came to the rescue as it has all season by forcing 17 turnovers in the first half that eventually led to a 66-51 win in Greater Western Ohio Conference crossover play. Butler improved to 12-2 overall and 7-2 in the GWOC North while West Carrollton fell to 4-11 overall and 1-7 in league play. In spite of the win, Butler coach DJ Wyrick was not happy with how his team handled prosperity – and a 30 point lead – in the fourth quarter. This one wasn’t pretty early. Playing short-handed without senior guard – and starter – Braedon Norman and Quentin Glover, the Aviators looked out of sync from the beginning. It took Butler over three minutes before they got their first basket by Ryan Wertz, but the Pirates were even more hamstrung as the Aviator defense forced 6 first quarter turnovers while holding West Carrollton scoreless for the first five minutes of the game. The Pirates took the lead 4-2 with 1:05 to play in the quarter and took a 4-3 edge into the second period. After that, the Aviators finally solved West Carrollton’s zone as they opened the quarter on a 7-0 run. Bryant Johnson scored inside and, after the Pirates cut Butler’s lead to 10-9, the Aviators outscored West Carrollton 15-2 over the remainder of the half to take a 25-11 lead at half. Three pointers by Tyler Montegue, Wertz, and Spencer Imwalle, who scored a career-high 11 points, fueled the rally. As has been the case all season, the third quarter belonged to the Aviators. Montegue scored 10 points on a pair of threes and two steals as Butler went on an 18-6 run to open the half which finally forced a timeout with 4:00 to play in the quarter. The Aviators would eventually build a 50-20 advantage before pulling their starters. The Pirates didn’t go easy though. West Carrollton hit five three-pointers over the final five minutes of the game that finally forced a timeout by the Aviators after their 30 point advantage had been cut in half at 61-46 with 1:27 to play which left Wyrick frustrated. The Aviators will face perhaps their final stern test next week until they face Sidney when they travel to Xenia. That game, currently scheduled for 7:30 p.m. at Xenia, may be moved to be part of the Flying to the Hoop event at Kettering’s Trent Arena if teams are unable to travel to Kettering due to the weather. The Buccs feature the GWOC’s leading scorer, Samari Curtis, who was averaging 32.5 points per game prior to Friday’s game versus Greenville. Curtis scored 31 on the Aviators last season in a thriller as Butler escaped with a 61-58 win at home. With Sidney falling at Fairborn on Friday with a game versus Trotwood looming, suddenly a path to the GWOC North championship has opened for the Aviartors. Reach Darrell Wacker at (937) 684-8983).